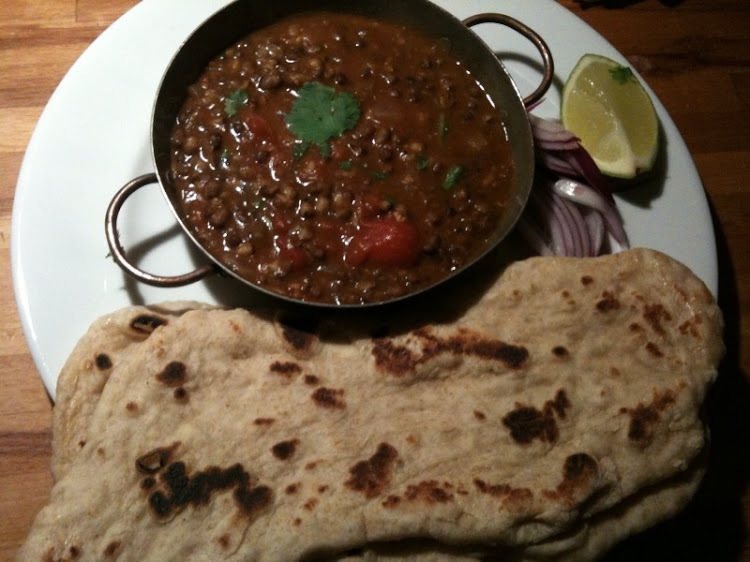 Black daal is a hearty, smokey lentil stew that is popular in northern Indian cuisine. My family never made it at home for some reason, so it was always a treat to eat it at restaurants. It often has a lot of butter and cream, perhaps that was the reason! Since I moved to Sweden and started to really appreciate these dishes, my aunt Kusum from Ahmedabad sent me a recipe for many things, one including this black daal recipe, and her recipes are always excellent and authentic! It is important to soak the whole urad lentil for at least 12 hours, especially if cooking without a pressure cooker, because they take a long time to cook. It is also important to slowly cook this for a long period of time, even if using a pressure cooker, in order to nurture the layers of flavor. One can eat this with basmati rice or naan. It is thick enough to be scooped into a piece of naan, but loose enough to be mixed with rice. Also fresh lemon or lime is a necessary condiment when serving, along with thinly sliced red onion marinated with a squeeze of lime and a pinch of salt and pepper. 1. Boil or pressurize black urad daal until tender. 2. In a heavy bottom pan on medium low heat, add butter, oil, onions, cinnamon stick, cloves, cardamom pods and bay leaf. Stir occasionally and cook until onions are golden brown. 3. Add to the onion mixture, ginger-garlic paste, chilies, coriander powder, cumin powder, turmeric, chili powder and cook for 1 - 2 minutes. 4. Add tomatoes to the above mixture and cook for 10 minutes, until the tomatoes start to leave the sides of the pan and/or the oil surfaces. Add black urad daal, salt and water and cook for 20 - 30 minutes on low heat until everything unites together harmoniously. Add cream and cook for another 5 minutes. 5. Garnish with coriander. Serve with rice or naan and a spritz of lemon/lime, and eat with a lemony onion salad.